Greens Bayou Greenway is open to the public as of Thursday, following a ribbon cutting at the bayou. It is the first to be revamped in the Bayou Greenways 2020 iniative. 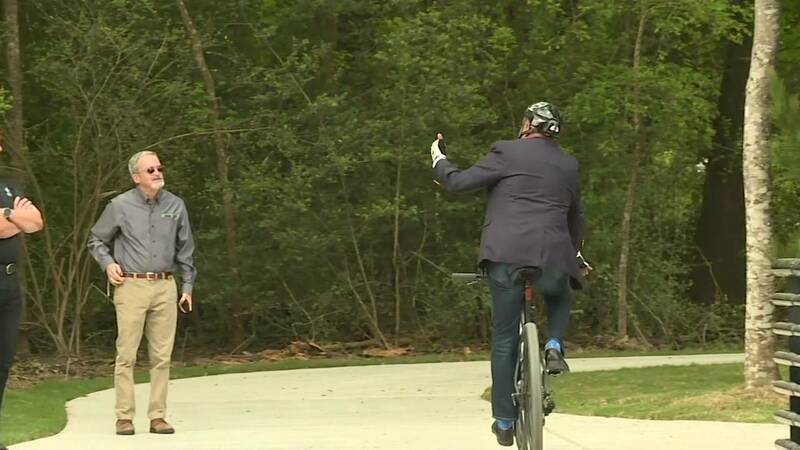 HOUSTON - Greens Bayou Greenway is open to the public as of Thursday, following a ribbon-cutting at the bayou. It is the first to be revamped in the Bayou Greenways 2020 initiative. The bayou greenway now touts a 2-mile concrete hike and bike trail segment with two new hike-and-bike bridges, new landscaping, preserved open space and neighborhood connections. Greens Bayou is the first of nine that will be getting a makeover, as part of an initiative that the Houston Parks Board says is "one of the most ambitious parks projects in the country." The project has a $220 million budget and aims to complete a 150-mile network of connected parks and trails along Houston's major waterways, according to a release from the organization.